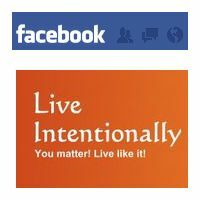 I’ve created a new Facebook page for Live Intentionally. Why? 1) It’s a place where Facebook users can connect with me and other Live Intentionally users to encourage and challenge one another to make the most of our lives. 2) One of the ways I’m intentional about staying connected with family and close friends is by limiting friend requests on Facebook to family and close friends. I connect with almost 30,000 people through Twitter, but I only have about 200 friends on Facebook. The Live Intentionally FB page enables me to connect with more people through Facebook without sacrificing the closeness I’ve established with people through my Facebook profile. 3) It’s a way for Facebook users to essentially “subscribe” to Live Intentionally and not miss any blog posts. If you don’t use an RSS reader but do use Facebook, instead of trying to remember to check LiveIntentionally.org regularly for new blog posts, just “like” the Live Intentionally Facebook page. Have you “liked” the new Live Intentionally Facebook page? If so, give me and other LI readers a shoutout. If you blog, write, sing or do any other creative work, have you created a Facebook page for people to connect with you? Do you find value in having a FB page separate from and in addition to your personal FB profile?